Have any of you taken the time to read through the 2012 Profile of Home Buyers and Sellers from the NAR? I love reading things like this as its perfect evidence of how the real estate business has progressed over the last 10-15 years. Remember when agents used to post their listing and open houses in the Sunday paper? I do, because I used to do it. I also used to scour the paper to see what was out there. Heck, I know it was before my time, but I used to hear stories from older agents that would tell of the old card catalog type system that preceded the MLS online. The charts below offer an interesting introspective into the real estate business. These charts below are courtesy of the NAR Profile of Home Buyers and Sellers for 2012. 18 years ago, the internet barely was in existence, and like I mentioned above, newspaper were the way to find out the information on a home listing. For whatever reason the NAR stopped reporting data on newspapers around 2003, but you can see that they amended the Newspaper tab to included News-Print Media in 2006. The chart shows the obvious evolution of the internet and I’m sure we all use it in our own way, whether it be our own websites, accessing the MLS, or even property records. 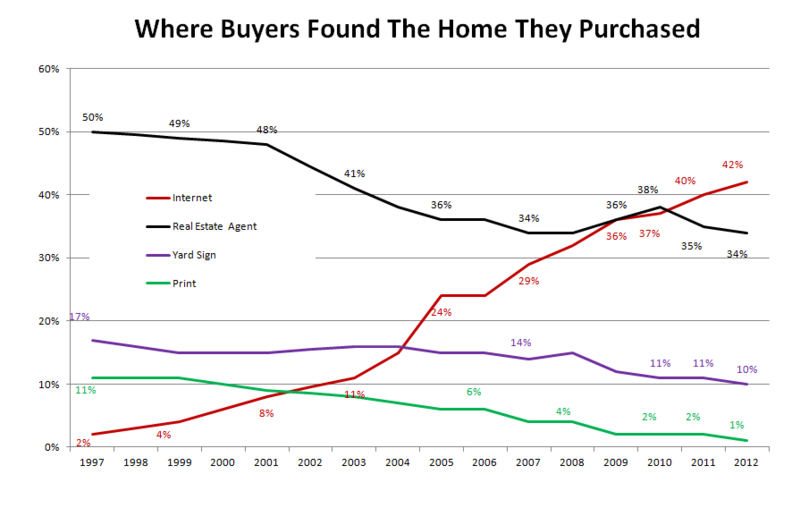 This chart is my favorite and it details where buyers found the home that they ultimately purchased. I think you’d all agree that the role of the agent has changed over time. Agents used to be the keepers of the information. Now agents act more as consultants. Buyers and sellers can pretty much gain access to the same information as agents, and in many cases become experts in specific geographic areas, even moreso than the agent themself. That being said, the agent still plays an important role in transaction and it has absolutely not been reduced. We see here that agents and internet play a large role in buying and selling a home, one that they used to share with Yard Signs and Print Media, which have largely disappeared. 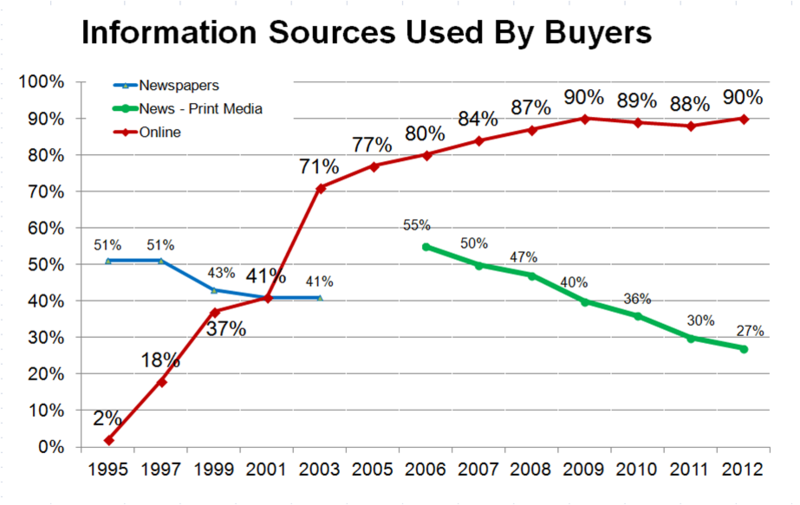 This last chart is also a good one when it comes to information sources. 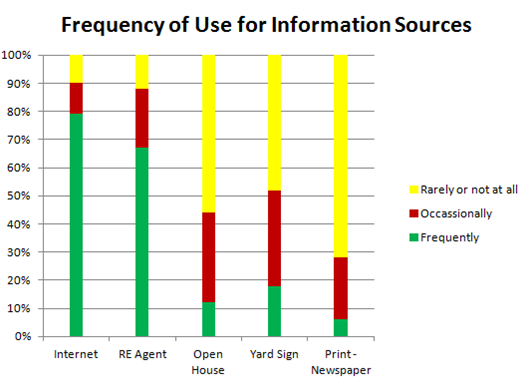 Look at how frequently the internet and real estate agents are used to gain information on the real estate market. The internet has become a dominating force in the real estate landscape. Its one where agents need to embrace the technology and integrate it into their daily routine. The biggest example is exactly what many of you are doing right now. Blogging. It didn’t exist even 5-10 years ago. I’d love to hear your thoughts on the report and information that I’ve posted! All agents need leads, no matter what they tell you. They all need good, qualified leads as well. Let Broker Dynamix help you with you lead generation. Our supplemental lead generation service focuses on the Long Tail searches as well as increasing your brand and footprint on the internet. Let us show you how we can help you take your lead generation to the next level!